Arrived at The Jazz Café just in time to bag 2 comfy seats at the front with some jazz buddies as the exquisite tones of Don’s trumpet was rising, Softly as in a Morning Sunrise; Don seems to like to set the standard as he has in the past by starting off with this lovely tune . What’s New and Sonny Rollins’ The Bridge, were followed by a delightful Don Forbes original called Little Blue Eyes, and a beautifully played, I Remember Clifford. Stan Tracey was featured on several occasions over the course of the evening, as we bobbed along with No Good Boyo, closely followed by more melodic Pen Pals. Another favourite influence of Don’s were Emcee Five, and he paid tribute to this Newcastle band with Hobson’s Choice… Not that being there to hear it was Hobson’s Choice for anyone in the very appreciative crowd, the Café was pretty full and the crowd were enjoying the music as the first set came to an end with Tenderly. A brief interval as the boys had a few minutes chat and catch up with some friends and then back in the hot seats for a lively Horace Silver number, as The St Vitas Dance opened the second set. 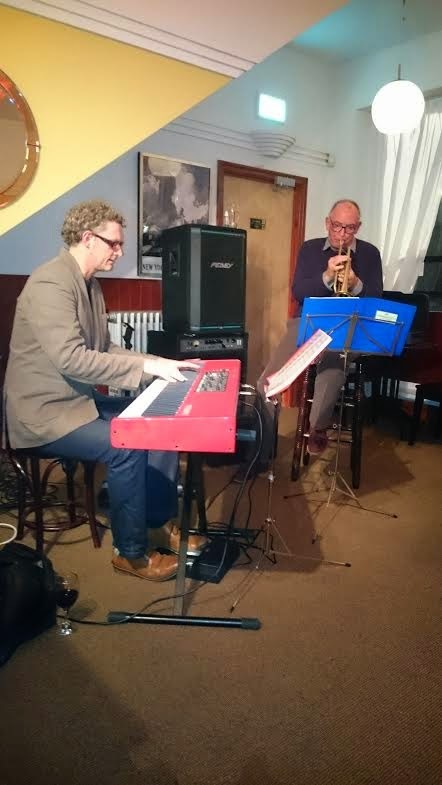 Next up was a tune that displayed the skilful tinkling of keys from Alan Law, changing the tempo to Bill Evans’ lovely ballad, My Foolish Heart that floated around the café. Another tempo change to a Latin groove with a Dizzy Gillespie tune that I didn’t quite catch the name of, and then it was back to Stan Tracey for I Lost My Step in Nantucket. As the evening drew closer to the end, and the patron numbers began to dwindle in the café, Don dropped in another original that Suspended Belief, leading us on to the final number a Freddie Hubbard tune Up Jumped Spring. Thanks guys, a most enjoyable evening of fine music and friends.